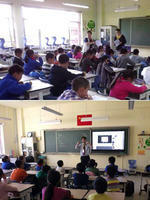 Shane English School Beijing is pleased to announce a new collaborative effort with local elementary schools, starting with "No. 4 Elementary School". SESB has become an important partner in providing after-school courses and the pictures here show teachers, Charlotte and Matt in action! With these additional English classes, everyone is positive that students' English abilities in this elementary school will greatly improve, and we all look forward to the challenges ahead!